Editor´s Note: Today we kick off a very special week in celebration of two festivities that define our biculturalism: Halloween and Dia de los Muertos (Day of the Dead.) 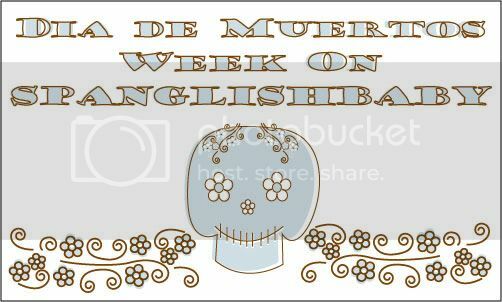 Throughout the week we will feature guest posts and videos that will add color, spice and vida to Día de Muertos Week on SpanglishBaby. So, make sure you are subscribed to our feed so you don’t miss a beat! Growing up along the border, in El Paso, Texas–a small town separating the United States and México–we lived with the Mexican and American cultures intertwined. As kids, we traveled in and out of two worlds daily. The moment we left our casitas to go to school, we entered our American culture, holidays and traditions, but at home we had our own language, cultures and traditions. In the meantime, some of our Mexican culture was watered down or lost in translation. As mothers of two beautiful children, our hope is to keep some of the Mexican traditions alive, but it’s taken some education on our part to consciously understand the differences. Halloween and Día de los Muertos (Day of the Dead) is a HUGE example of how our two worlds melted together. However, these two holidays are quite different. Halloween is celebrated on October 31 and it’s a day dedicated to dressing up, children and adults alike, and going out and receiving candy or attending some form of masquerade party. Churches have made an attempt to make it less ghoulish by having carnivals where children can take part in pumpkin carving, or face painting, all the while eating yummy food like corn on the cob, candied and caramel apples, and kettle corn. But the haunted house is always looming. The images used to portray Halloween are somewhat morbid in that it’s usually characterized by ghouls, ghosts, witches, devils, and the like. But mothers try to make it less scary by having our children dress up as princesses or super heroes. Día de los Muertos is a two day holiday celebrated on November 1 and 2. Día de los Muertos was originally designed to celebrate life by honoring the memory of the departed. On these days, families go to the cemetery and place beautiful flowers on the graves of their lost relatives; singing usually takes place and sometimes mariachis show up to serenade the dearly departed. It is believed that on these days the gates of heaven open up and children who have passed on come to Earth to visit on November 1, called Día de los Angelitos–the day of little angels. On November 2, the gates open up again and adults come down to visit, this day is called All Soul’s Day. Although we have never partaken in this holiday, we want to incorporate this cultural tradition into our families Fall Festivities. We will attempt to start by creating a small altar. The altar will be created in a small corner of a room, probably the dining room. 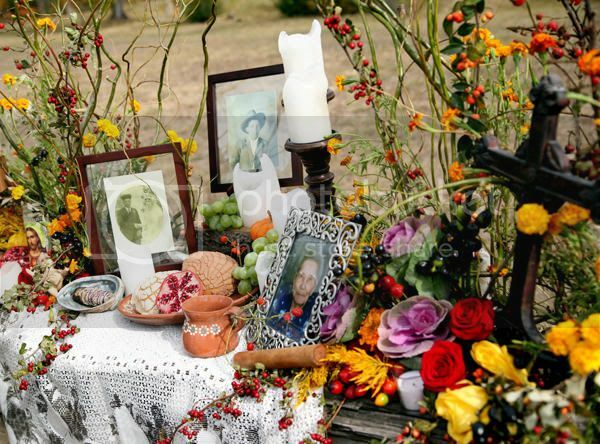 According to tradition, an altar can have candles, pictures of the deceased, flowers (usually marigolds), drinks and food. The belief is that any visiting souls may be hungry from their long journey and so the food and drink is for nourishment, in order to help them make their journey back. This is supposed to be a happy day, filled with eating, drinking and sitting around and telling stories of those being honored. This year we will honor my husband’s father and grandparents as well as my grandparents who have since passed away. We hope to retell memories of them to our children and delight in the times we shared with them. Our hope is to keep the memory of them alive for both us and our children. Creating a beautiful altar with lots of bright marigold flowers. Placing pictures of deceased loved ones on the altar. Making pumpkin empanadas with our children. Making mole, another family favorite. Placing candles on the altar. Once all the preparations have been made, we can enjoy the evening by lighting the candles, and retelling stories of our deceased loved ones while we feast on mole, pan de muerto, drinks and pumpkin empanadas. My husband and I took the time today to go through all of our pictures of his father and all of our grandparents who have passed away. We talked about the feast and all the stories we can’t wait to share with our children. We have decided to download songs they liked as well and have them playing while we retell stories to our children. I especially remember dancing in the kitchen with my grandmother, Jesusita. I remember her dancing with me to her favorite song, “Jesusita en Chihuahua;” we all remember this as one of her favorite songs. Although my sister and I live in two different states, she in Colorado and I in California, we have agreed to introduce this holiday and tradition to our respective husbands and children. No year like the present to begin anew. We are both thrilled to educate our children about traditions that are part of our culture. She will take part in Día de los Muertos with her two beautiful children and husband in Colorado and I with mine in California. We can’t wait to share our mutual experiences, pictures and stories of the event. Halloween has played a fun part in our families but now we are even more excited to introduce Día de los Muertos on November 2 with our families. It will be a beautiful way to honor our ancestors and share it with our children and spouses. The frightful visions we have of death shouldn’t be so morbid, they can in fact be, pleasant and joyful. Whether you’re celebrating Halloween or Día de los Muertos be sure to check out the Muy Bueno Cookbook blog for festive recipes such as Pumpkin Empanadas and Persimmon Margaritas to help you celebrate in great spirits — they’re simply to die for! 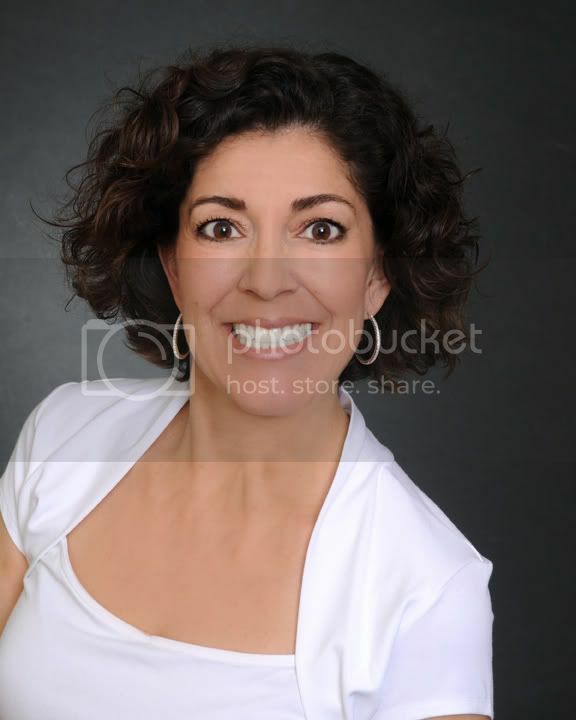 Veronica Gonzalez-Smith resides in Los Angeles, CA, with her husband and two children. She is a science teacher full time and on top of that is on a journey to writing a cookbook with her sister and mother titled Muy Bueno: Three-Generations of Authentic Mexican Flavor. We have a little niche in our house where I’ve put a crucifix that belonged to my late grandfather. It was a phone shelf when our house was built in 1955 but we use it as a place where my sister-in-law puts Velas (candles) and on the wall above it is a picture of the Virgen de Guadalupe. Now reading your post I just realized how wonderful it would be to put some marigolds (or have the kids draw pictures of some?) and a glass of atole there in our little niche, with some photos, and invite family for dinner and stories. I love the idea about old songs. Maybe this will be a taste of home traditions for my husband, and good for the kids, to know there is something besides trick-or-treating happening. And even for myself, to embrace this tradition means remembering loved ones. We are thrilled that our post gave you some additional ideas for your home altar. Thanks for sharing what sounds like a beautiful niche for those you love who have passed on…the Bud Light is a special touch for your late Tio…This is quickly becoming one of my favorite holidays. I recently asked my Mom why I don’t remember celebrating this day growing up and she said it was more of a tradition in Central mexico like Mexico City. But I don’t think that should matter. When my husband’s grandfather passed away recently hubby came up with the idea of honoring him with a photo movie from his lifetime.The family sat together and watched the movie and we smiled and cried. I think that is very similar to el Dia de los Muertos. Celebrating and honoring your loved ones who passed away. 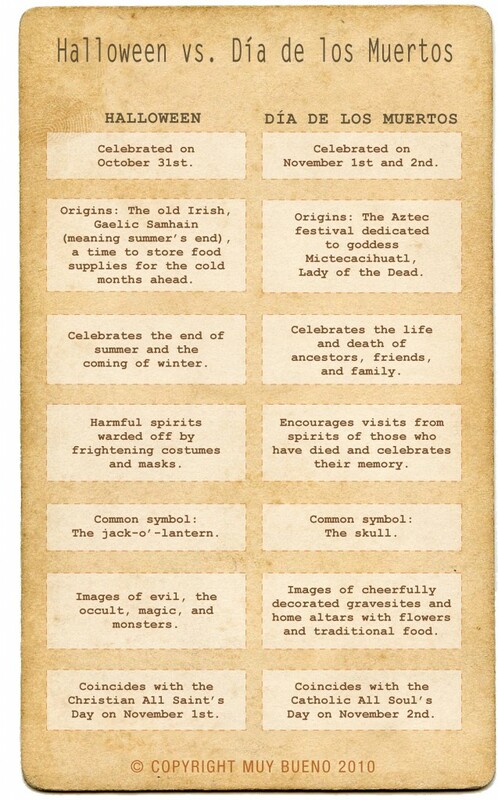 And I think I will be incorporating this tradition because I want the memory of hubby’s grandfather to stay alive. I want my daughter to remember (through our stories) who her Great-grandfather was. If you don’t mind I have linked your post on my blog today. Thanks for sharing our article on your blog! I’m so happy to hear that you are going to start this tradition in your home. Its truly a wonderful tradition and holiday! If you are ever in the mood for more Mexican culture we have some great recipes on our blog. Yvette Marquez´s last post ..Persimmon Mojitos for Everyone! I read ths article completely about the resemblance of hottest and preceding technologies, it’s awesome article. to start my own blog soon but I’m a little lost onn everything. such as pens, lip sticks, keychains etc. Good post. I learn something new and challenging onn websites I stumbleupon on a daily basis. It’s always useful to reazd through content from other authors and use something from other websites. It really is a fantastic and handy part of details. I’m just glad that you choose to embraced this beneficial info with us authority niche machine review. You should keep us updated like this. Appreciate expressing. remove specific candies, or simply reach a defined score. change. Diamond Digger is now one of the most popular games. I’m not sure where you’re getting your info, bbut good topic. You managed to feed into only recent US custom and truly trivialize the Celtic New Year. How politically insensitive. Do your research. Hmm Well I was just searching on yahoo and just came across your blog, in general I just only visit blogs and retrieve my required info but this time the useful information that you posted in this post urged me to post here and appreciate your diligent work. I just bookmarked your site. Thank you again. it looks finbe however, iif opening iin IE, it’s got some overlapping issues. which is helpful designed for my knowledge. The broadband aspect of Sky’s providing also includes a free restricted period trial of McAffee’s Web Safety Suite to maintain you safe on-line. If you would like to get a great deal from this article then you have to apply such techniques to your won website. I am not Hispanic, but full blooded German. I live in California, 100 miles north of Mexico. From my children on, we are now German/Mexican and one grandchild is African American. My husband and I attended the Dis De Los Muertos event at Hollywood Forever Cemetery on October 22, 2011. My husband dressed as the grim reaper and had his picture taken dozens of times. I dressed as a sugar skull. We enjoyed ourselves, watching the feathered dancers, and taking in the beautiful alters. As of now, and going forward, we are going to make an alter of our departed, and include in my grandchildren, so they will be able to celebrate their heritage with their grandparents. It will be a way for them to unite their European/Hispanic sides into a meaningful blend of solidarity. Karen, you are a German living in California and I am moved here to Germany from California. CRAZY! Will you be celebrating Dia de los Muertos this year? I teach Spanish here in Germany and look forward to sharing this great holiday with my students this year.